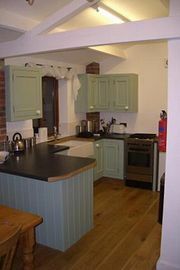 The Cart Lodge has a large entrance hall from which there is a large utility room (washing machine, tumble dryer and freezer), leading from the entrance hall is the kitchen, dining room and the large lounge. 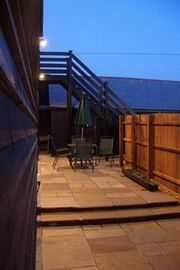 The accommodation offers a large downstairs family bedroom (double and single beds) with en suite shower room all with full wheelchair access. 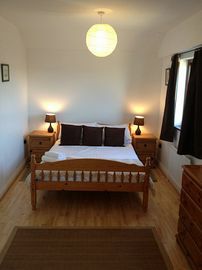 On the first floor there are two twin rooms, one double room with en suite and a large gallery with sofa bed. 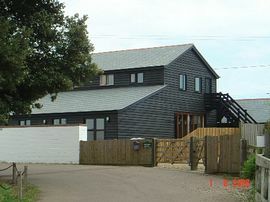 The views over the marshes and Colne / Blackwater estuaries are excellent from the gallery. The Cart Lodge is set within a now partly redundant farm yard at the end of a quite lane, 1.6 miles from the village centre where there are numerous services including three pubs, post office, two shops, three restaurants, hairdressers and a florist to name some. Bus routes run to both Clacton on Sea (5.9 miles) and Colchester (13.7 miles) from here. Colchester, Britain's oldest recorded town offers much for those interested in architecture, history and shopping plus a very good Zoo. There are pleasant walking & cycling opportunities around the farm, village and nearby countryside. Fishing at our reservoir is included (rod licence required), passes for nearby nature reserves are included, there are superb bird watching opportunities (regular sightings of the once rare Marsh Harrier for example). Using the A14 head to Ipswich and join the A12 heading towards Colchester. Take the A12 towards Ipswich. Take the first right turn to Great Bentley. At the next T-junction turn right, and then take the immediate left. Stay on this road out of Great Bentley and continue for a further 2.5 miles until you reach the next t junction (B1027). Turn left here. Continue for a further 1.5 miles then take the turning right into St. Osyth (Colchester Road). At the crossroads in the centre of St. Osyth, take the right turn onto "The Bury". Stay on this road passing the Priory on the right, then the recreation ground on the left and cross the causeway by the boatyard. Turn into Lee Wick Lane and continue down the lane for about � mile passing the farm at the top, until you reach Lee Wick Farm yard, the Cart Lodge is situated about 50 yards after the first speed bump on the left. Weekend / short breaks calculated on a pro rata basis plus a surcharge. 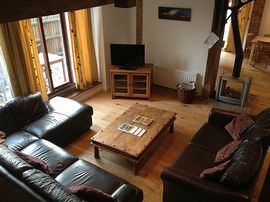 Bookings taken for weekends / short breaks except during main summer holiday.